It all started after reading If you can’t choose, pick at random at Aeon.co. It delves into how choosing at random can be best in some cases. Give it a read, it is interesting. Among the HackerNews comments about this submission there were some mentions about choosing at random in real life, and to the novel The Dice Man (Amazon | Book Depository). I got interested in the idea. My late afternoon routine usually consists of reading and probably playing with some iPad game. Since I’ve worked as an editor in an app review site, I have quite a wide array of games always installed on my iPad (current count: 106 games.) I ended up playing mostly the same games though, which is kind of stupid with such a wide array of options. Here randomisation entered: I generated a random number to choose a folder (well, a sheet in the “games” folder) and another one to choose a game within that folder. This way I got more varied entertainment (nice) and one day I picked up a backgammon app. And why not? Let’s play some backgammon, if it was good enough for Conway, I’m sure I can enjoy it eventually. Exactly at the same time I was reading a lot of literature on improvement, to see what I could do to improve my go playing abilities. Anything from chess improvement books, psychology of practice, calculation when playing draughts. So a natural next step was to pick a few backgammon books and see if there was some lesson I could cross-reference to go. I could always just improve my backgammon and have some good games. I quickly found out that backgammon is in the “same” set as chess. Even though not formally solved, the best computer opponents can slice through human players like a hot knife through butter. 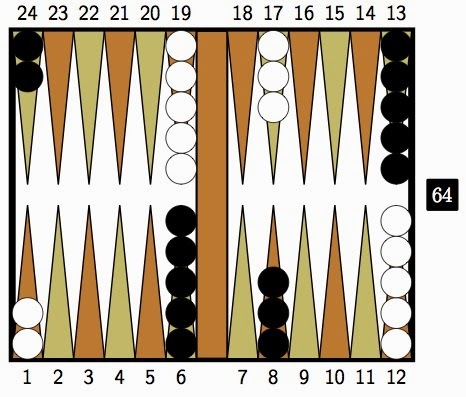 More interesting for me, backgammon engines are self-trained time-difference neural nets. You can read about seminal paper on this method by Tesauro, here. An advantage of having ultra-strong computers is that they can analyse your games and pinpoint which moves were good and also how bad the move was compared to perfect (well, computer-perfect) play. So, I downloaded one of the best apps in the app store and started playing, all the while reading Bill Robertie’s Backgammon for Winners (Amazon | Book Depository). It works as a good introduction to the game all the while giving a lot of great pointers about strategy. At this point I should tell a little about how backgammon is played. The 6 places closest to your home are known as your home board, and correspondingly the 6 further away are your opponents’ home board. Rules are simple (verbalising them is the hardest part, I have just found :D) but make up for a very interesting and fast-paced game. Oh, before I forget there are two more things. Backgammon is played in matches for points, because a backgammon game can end with 3 different results: A normal win is scored when you just get all your checkers to home and your opponent also got some to hers. A gammon (which scores twice) happens when you get all and your opponent got none to home, and a backgammon (scores thrice) when there are still enemy checkers in your home board when you finish. In addition to the different game results, a game changer (and something I really like about backgammon) is the doubling cube. 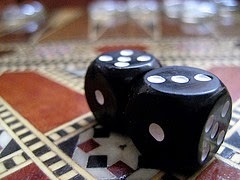 The game starts with a dube numbered in powers of 2 from 2 to 64 between the players. When a player feels ahead, he can pick it up and offer a double. Then, the opponent can accept (hence, they play the game for 2–4–6 points instead of 1–2–3 points) or reject it (resigning for just 1 point.) The player who accepts now owns the cube and can double at her own discretion. The process could go up indefinitely, but of course it doesn’t. The doubling cube just works perfectly to shorten matches and games, greatly speeding play. Back to reading suggestions, Bill Robertie’s Backgammon for Winners (Amazon | Book Depository) has enough strategy to get you covered, but eventually you’ll find yourself needing something more, and I can heartily recommend Magriel’s Backgammon (Amazon). Huge book, very interesting and well-written. I have read it 1.5 times already, and there’s still lots of things I get wrong in my games. If you have never played backgammon I recommend you pick some free app and start playing in your computer, tablet or smartphone. I personally can recommend Backgammon NJ which is available for Android and iOS and GNU Backgammon for Mac (or Windows, or Linux.) I actually don’t recommend playing on a real board. You’ll get slogged by counting where 6 goes from here to there, computers make it easier by showing all valid moves. It took me 4 months and several hundred quick games against computers until I got good at “moving” so I know by sight where moves go. If you are looking to play with real people, once you have picked up rules and have some knowledge, head over to Dailygammon. It is 100% free, turn-based play, and has an awesome feature that lets you play much faster than usual. You roll and move, and then the computer assumes your opponent did the best move for their roll, gives it to you and lets you enter more moves. If your opponent is good (so, he actually picks the best move when offered) games are really fast, since you are effectively playing in parallel. And if he does not, the game is “as slow” as any turn-based. Neat, isn’t it?